Metal Slug 1st Mission was my third Neo Geo Pocket game. Anyone who knows me knows that I LOVE Metal Slug for the Neo Geo, so it was natural that this game would be one of my first purchases! While Metal Slug 1, 2 and X are some of the best platform shooters you will find on any system, 1st Mission is one of the best hand-held shooters you can get. Don't be fooled into thinking that its just another generic platformer like many of the ones available for the Gameboy Color (you know, the games that look as if they were thrown together over a weekend), because it is far superior to them. When I first played it, I did have my doubts because the game wasn't quite what I was expecting... but thankfully it turned out that I was wrong, wrong, WRONG to doubt it. While the game differs ever so slightly to the original games on the Neo Geo, it is still the same game at heart. I could tell this as soon as I heard the familiar music on the first stage (which is faithfully recreated from the original). The first difference you will notice is that you don't die after taking just one hit, instead there is now an energy bar. Once the bar runs out its game over, but you do get lots of continues and a nifty save option which is very helpful. The thing that makes the game interesting is the variety. 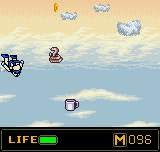 Aside from the good level design and different routes that can be used to get through them, you can take control of two different vehicles, the jet and the Metal Slug tank. Taking control of these vehicles is pretty good fun, especially Metal Slug (which as I've mentioned before looks a lot like Bonaparte from Dominion Tank Police, which means its COOL). Unlike the Neo Geo versions, you do not get a choice in whether you use these vehicles or not. The sections of each level that have vehicles MUST be completed with them. 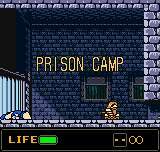 This is where SNK implemented quite a nice touch... if your vehicle is destroyed before you complete that section, you don't die, instead you are either captured by the enemy and put into a Prison Camp from which you must escape (if you are in the tank), or you have to eject from your plane and perform a parachute jump. Escaping from the POW camp with just a knife is actually pretty easy, while the parachute jump is a little harder because you have to open your 'chute at just the right time. Too early and you risk being shot down by the enemy, too late and there are obvious consequences (well, you make a pretty pattern over the floor)! Like its arcade forefather, there is a choice of powerful weapons available that you can collect during game play. These include the Pistol, which is your standard gun and has infinite ammo, the machine gun, the shotgun and the rocket launcher. You also have grenades at your disposal and an extra powerful weapon can be collected for each of the vehicles too. The only downside to the extra weapons you collect is that they run out very quickly. The Metal Slug series is well known for its detailed graphics, and SNK have managed to do a darn good job considering the limitations of the hardware. Many levels have some nice parallax scrolling (which shows off the fact that the Neo Geo Pocket is 16 bit) and there is a lot of variety in them too, with each stage looking different to last. I like some of the clever animation touches too, such as the enemy soldiers spotting you and then quickly pointing straight at you before shooting, which gives you the chance to dodge their fire. Unfortunately one unwelcome characteristic of previous versions has also been carried over: the slowdown! The slowdown is not terrible, so it isn't something to worry about too much. It certainly doesn't spoil the game. If you are considering buying a Neo Geo Pocket, or if you already have one, then this game should be somewhere near the top of your shopping list in my opinion. Don't hesitate, go and buy it today!